For the Russian defense industry, 2014 has been a complicated year. Yet despite numerous difficulties, some examples of military technology successfully underwent state testing and were transferred to the armed forces for future use. RBTH presents five additions to the armed forces that went into service in 2014 – the newest innovations of the defense industry. The first Yasen submarine took 18 years to build due to political and economic turbulence. In 2014, after years of testing at sea, the submarine, called Severodvinsk, entered the Russian navy. Russia's first multipurpose submarine, its combat objectives include destroying enemy ships and submarines and striking land targets with winged missiles. Yasen carries 24 Yakhont supersonic anti-ship missiles with a range of up to 220 miles, and Granat missiles capable of hitting targets around 2,000 miles away. For accurately striking land targets, the submarine is equipped with Caliber precision missiles. The new man-portable air-defense system has substituted the famous Igla, which not only served in the Russian armed forces, but was also successfully exported to other countries. The system is equipped with an ‘intelligent’ self-guided head that does not react to fake targets dropped by military planes. The Verba ‘sees’ unmanned aerial vehicles and winged missiles. These are targets with low thermal radiation and detecting them is not easy. However, for Verba this is a feasible task, since its fire-and-forget guidance operates in three spectrums (the former Igla operated in two). Verba entered the armed forces at the end of summer 2014 and according to military experts, is a worthy rival to the American Stinger missile. This miniature robotic system on a tracked chassis, with the touching appearance of a cartoon character, has heralded a new era in non-contact guided combat in any time of day, under any conditions, especially the complicated conditions found in dense urban developments. Platform-M is capable of carrying out reconnaissance and patrol missions, as well as guarding strategic objectives. Equipped with the Kalashnikov rifle, the robot can put up an effective resistance and destroy even moving targets - and all of this without human participation, since Platform-M is guided automatically. The SU-35S 4++ generation multipurpose super-maneuverable destroyer is the Russian Air Force's latest airplane. Fifth-generation technologies, including composite material, were used for its construction. The SU-35 will be Russia’s main aerial strike force in the short term until it is replaced with the fifth-generation Sukhoi PAK FA. The fighter, which entered the Russian Air Force in 2014, will be used primarily to destroy enemy planes. Equipped with short, medium and long-range guided missiles, it can also strike land targets, penetrating anti-aircraft defense systems. Its airborne radar system can simultaneously accompany up to 30 targets and help it fire on up to eight air targets. It also has export potential: Russia is currently negotiating supplies to China. In 2014 the Russian Navy began to welcome into service these third-generation diesel submarines, which abroad are respectfully referred to as "black holes" for their power. The submarines from the improved 636.3 project have higher combat efficiency (in comparison with previous projects). The Varshavyanki (as the submarines are also called) can now ‘see’ farther and simultaneously remain unseen. The subs are equipped with modern torpedoes and Caliber winged missiles. They also contain new navigation equipment and a modern data control system that works autonomously and does not require human intervention. 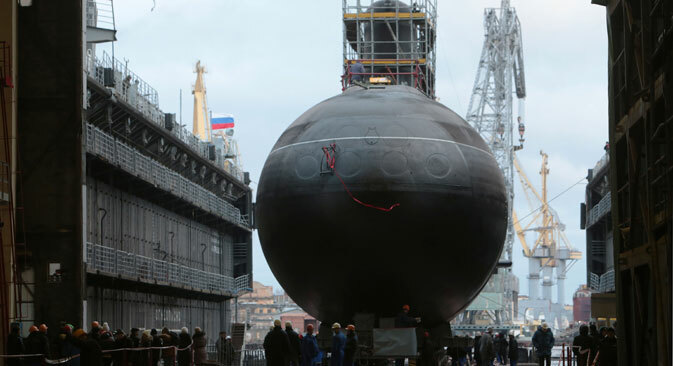 Six 636.3 Project submarines are to be constructed and given to the Black Sea Fleet. The first 636.3 submarine, called Novorossiysk, is already serving in the fleet.